Whether you rely on wood, pellets, or coal for heat, or you just like the atmosphere of a blazing fire now and then, it's time to start thinking about chimney safety. Chimney fires tend to spike in early fall and winter when homeowners are firing up their stoves for the first time after a few months of disuse, and these fires can quickly spread, taking down an entire house. You don't want to be a victim, and fortunately, it's very easy to avoid common chimney safety pitfalls. Here's how. If you haven't had one yet, schedule a chimney safety inspection as soon as possible. It's advisable to have a chimney sweep check annually for emerging safety problems before you start using your stove or fireplace. The sweep can look for blockages in the pipe, problems with the spark arrestor, holes, or damage to the lining of your stove or chimney. For those with brick chimneys, the inspection should include a thorough probing of the bricks and mortar to check for weaknesses -- especially if you live somewhere with lots of seismic activity, like California. The inspector will determine whether the chimney needs to be cleaned. If you find that your chimney requires frequent cleaning, you may have a problem -- with the fuel you're using, your fireplace, or the way you manage fires. Talk to the chimney sweep to discuss the issue and determine what's going on; if you are burning green wood, for example, it may be generating a lot of creosote that could be gumming up your chimney. A stove thermometer may not look pretty, but it's a good safety tool. For one thing, you can make sure you are burning fuel in the optimum range for the most efficient combustion, which equals more heat; less waste; and less generation of byproducts of combustion that cause respiratory problems, buildups of soot, and other issues. Furthermore, if the stove gets too hot, you can take action to bring the temperature down before it gets dangerous. Consistent high temperatures may damage your chimney and lead to a fire. Time to roll up your fake bearskin rug. You should have a tile or thermo-resistant pad for your stove, which should extend at least a foot from the doorway to ensure that any errant sparks fall harmlessly. That firebreak doesn't have to be ugly or out of place; a Cleveland tile contractor can make it a beautiful and seamless part of the decor. Be sure to position furniture (especially bookshelves and flammable upholstery) well clear; even if sparks don't hit them, high heat can still be a problem. Keep children and pets away from the stove, with a grate or gate if necessary. How are your fire extinguishers, carbon monoxide detectors, and smoke alarms doing? Fall is a good time to make sure your fire extinguishers are fully charged: if they aren't, take them to the fire station for a fillup. You should also test your carbon monoxide detectors and smoke alarms (remember: one in every bedroom along with the kitchen and any room where there's a stove or fireplace) to make sure they're working. If they're battery powered, change out their batteries when the clocks change every fall! So you don't have a chimney? Okay, do you heat with gas, or have a dryer? If the answer to either of these is "yes," get all your vents checked, including the dryer vent -- a blockage in a dryer vent can cause a serious fire thanks to the heat of the dryer and the highly flammable lint inside. An HVAC technician can conduct an inspection of all the vents in the house to check for blockages, buildups, and signs of disrepair. Professional organizations like the Chimney Safety Institute of America provide certification programs for technicians as well as ongoing information on chimney safety for the public. Your local fire department may also have information for you on chimney sweeps in the area and what you can do to reduce the risk of fire; they would very much prefer to not visit your house this winter! 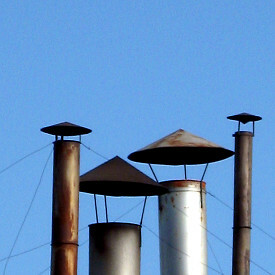 And don't forget: there's spring chimney maintenance to think about too.